Using microorganisms to treat the environment pollution has been found as the most effective method to treat the environment pollution, because it can settle the problems which the previous technologies such as anaerobic and aerobic could not. However, the advanced technology still cannot be utilized in Vietnam due to the lack of appropriate investments. Biology has been applied in a large scale in processing and preserving farm, forestry and seafood produce for a long time. In recent years, scientists have been using the microorganisms ed from the nature or created from new microorganism strains in treating environment pollution as well. The scientists from the Vietnam Academy of Science and Technology has successfully found out the process of making versatile biological products Hudavil (HUD 5), which would be useful in treating environment pollution in aquatic farms, especially black tiger pawn or catfish ponds. With the useful microorganisms, the scientists have successfully generated microbial compositions and probiotics production technique with higher density, which allows metabolizing the pollutants into useful nutrients, non-toxic to people and animals. As such, the products help create the ecological balance for aquatic ponds. HUD 5 has been utilized in the fields for three consecutive years in Tra Vinh, Soc Trang and Ca Mau provinces, which has shown fully satisfactory results: the percentage of successfully aquatic farming with HUD 5 was over 90 percent. The households which used HUD 5 for their shrimp ponds harvested 3.5-6.5 tons per hectare a crop, or 58 percent higher than the productivity of other ponds which did not use HUD 5. TO date, HUD 5 technology has been transferred to 30 factories and enterprises which make microbiological products for the salt intruded areas in Mekong Delta. The scientists of the science academy have also succeeded in making microbiological products to treat polluted water resources. They have ed 30 actinomycete strains and 20 strains of thermophilic bacteria, which can generate strong decomposition of organic matter in the wastewater. Dr. Tang Thi Chinh from the environment technology institute said that biology has been used widely in the world thanks to its great advantages. Especially, it is a kind of “clean technology” which can create the impetus for sustainable development. The products generated by the treatment process with biology are really environment friendly. 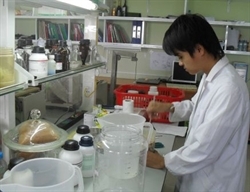 Pham Huong Quynh, MA, from the Thai Nguyen Industry Technology University, said treating polluted water can bring effects quickly, but the process can produce side effects. The solution requires low initial costs, but in fact, it would be costly because it is necessary to repeat the treatment process many times. However, despite the great advantages, biological solutions still have not been utilized in a large scale in Vietnam. Dr. Chinh said most of the modern equipments have been donated by foreign organizations, while the money from the state budget is just enough to buy simple equipments. Meanwhile, due to the modest budgets, it is nearly impossible to carry out big scale research projects.